Mac n' Cheese bites are a homey appetizer. If you are going for comfort rather than style this New Year's Eve, these fried morsels of cheesy goodness are the perfect party food. 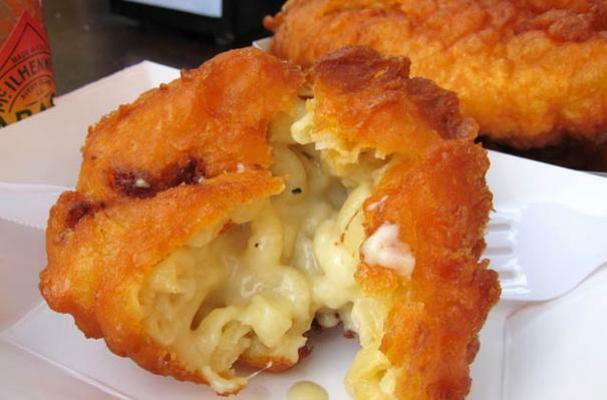 Balls of rich mac n' cheese are dredged in bread crumbs and then fried until golden brown. They are guaranteed to be gobbled by all your guests. While the pasta is cooking, in a separate pot, melt the butter. Whisk in the flour and mustard and keep it moving for about five minutes. Stir in milk and paprika. Simmer for ten minutes. Stir in 3/4 of the cheese. Season with salt and pepper. Fold the macaroni into the mix and pour into a 2-quart casserole dish. Top with remaining cheese. Season the flour with cayenne, salt,and pepper. Dredge each piece through the flour mixture and gently tap off extra. Dip in the egg wash and then coat with the bread crumbs. Allow them to rest for 5 minutes so the crust can set. Very carefully drop into the oil and fry until golden brown. Drain on paper towels for a few minutes or place on a rack with a cookie sheet underneath.